This article describes two ways to take over a DNS domain name in an unmanaged directory in Azure Active Directory (Azure AD). When a self-service user signs up for a cloud service that uses Azure AD, they are added to an unmanaged Azure AD directory based on their email domain. For more about self-service or "viral" sign-up for a service, see What is self-service signup for Azure Active Directory? When you perform an "internal" admin takeover of an unmanaged Azure directory, you are added as the global administrator of the unmanaged directory. No users, domains, or service plans are migrated to any other directory you administer. When you perform an "external" admin takeover of an unmanaged Azure directory, you add the DNS domain name of the unmanaged directory to your managed Azure directory. When you add the domain name, a mapping of users to resources is created in your managed Azure directory so that users can continue to access services without interruption. Some products that include SharePoint and OneDrive, such as Office 365, do not support external takeover. If that is your scenario, or if you are an admin and want to take over an unmanaged or "shadow" tenant create by users who used self-service sign-up, you can do this with an internal admin takeover. Create a user context in the unmanaged tenant through signing up with such as Power BI. For convenience of example, these steps assume that path. Open the Power BI site and select Start Free. Enter a user account that uses the domain name for the organization; for example, admin@fourthcoffee.xyz. After you enter in the verification code, check your email for the confirmation code. In the confirmation email from Power BI, select Yes, that's me. Sign in to the Microsoft 365 admin center with the Power BI user account. You receive a message that instructs you to Become the Admin of the domain name that was already verified in the unmanaged tenant. select Yes, I want to be the admin. 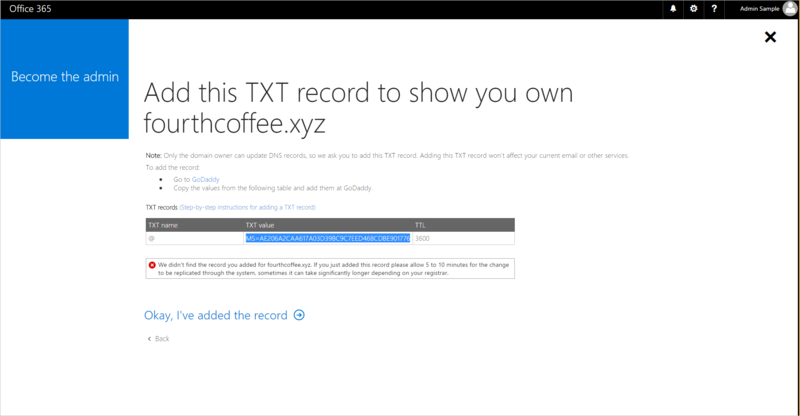 Add the TXT record to prove that you own the domain name fourthcoffee.xyz at your domain name registrar. In this example, it is GoDaddy.com. When the DNS TXT records are verified at your domain name registrar, you can manage the Azure AD tenant. 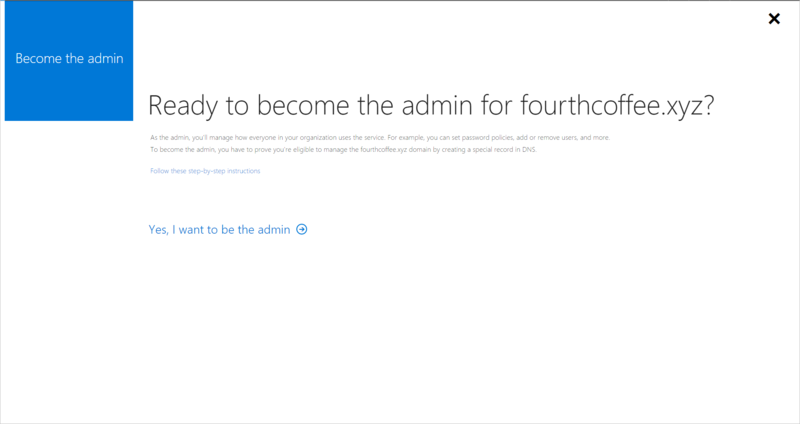 When you complete the preceding steps, you are now the global administrator of the Fourth Coffee tenant in Office 365. To integrate the domain name with your other Azure services, you can remove it from Office 365 and add it to a different managed tenant in Azure. Open the Microsoft 365 admin center. Select Users tab, and create a new user account with a name like user@fourthcoffeexyz.onmicrosoft.com that does not use the custom domain name. Ensure that the new user account has global admin privileges for the Azure AD tenant. Open Domains tab in the Microsoft 365 admin center, select the domain name and select Remove. If you have any users or groups in Office 365 that reference the removed domain name, they must be renamed to the .onmicrosoft.com domain. If you force delete the domain name, all users are automatically renamed, in this example to user@fourthcoffeexyz.onmicrosoft.com. Sign in to the Azure AD admin center with an account that is the global admin for the Azure AD tenant. Select Custom domain names, then add the domain name. You'll have to enter the DNS TXT records to verify ownership of the domain name. Any users of Power BI or Azure Rights Management service who have licenses assigned in the Office 365 tenant must save their dashboards if the domain name is removed. They must sign in with a user name like user@fourthcoffeexyz.onmicrosoft.com rather than user@fourthcoffee.xyz. If you already manage a tenant with Azure services or Office 365, you cannot add a custom domain name if it is already verified in another Azure AD tenant. However, from your managed tenant in Azure AD you can take over an unmanaged tenant as an external admin takeover. The general procedure follows the article Add a custom domain to Azure AD. External admin takeover is not supported for any service that has service plans that include SharePoint, OneDrive, or Skype For Business; for example, through an Office free subscription or the Office Basic SKU. You can optionally use the ForceTakeover option for removing the domain name from the unmanaged tenant and verifying it on the desired tenant. This ForceTakeover option will not move over users, or retain access to the subscription. Instead, this option only moves the domain name. For RMS for individuals, when the unmanaged tenant is in the same region as the tenant that you own, the automatically created Azure Information Protection tenant key and default protection templates are additionally moved over with the domain name. The key and templates are not moved over when the unmanaged tenant is in a different region. For example, the unmanaged tenant is in Europe and the tenant you own is in North American. Although RMS for individuals is designed to support Azure AD authentication to open protected content, it doesn't prevent users from also protecting content. If users did protect content with the RMS for individuals subscription, and the key and templates were not moved over, that content will not be accessible after the domain takeover. When you perform an external takeover, Power BI content that was created before the takeover is placed in a Power BI Archived Workspace. You must manually migrate any content that you want to use in the new tenant. You can see these cmdlets used in PowerShell example. connect-msolservice When prompted, sign in to your managed tenant. get-msoldomain Shows your domain names associated with the current tenant. new-msoldomain –name <domainname> Adds the domain name to tenant as Unverified (no DNS verification has been performed yet). get-msoldomain The domain name is now included in the list of domain names associated with your managed tenant, but is listed as Unverified. get-msoldomainverificationdns –Domainname <domainname> –Mode DnsTxtRecord Provides the information to put into new DNS TXT record for the domain (MS=xxxxx). Verification might not happen immediately because it takes some time for the TXT record to propagate, so wait a few minutes before considering the -ForceTakeover option. If your domain name is still not verified, you can proceed with the -ForceTakeover option. It verifies that the TXT record was created and kicks off the takeover process. The -ForceTakeover option should be added to the cmdlet only when forcing an external admin takeover, such as when the unmanaged tenant has Office 365 services blocking the takeover. get-msoldomain The domain list now shows the domain name as Verified. In your public DNS namespace, create a DNS txt record that contains the value that you copied in the previous step. The name for this record is the name of the parent domain, so if you create this resource record by using the DNS role from Windows Server, leave the Record name blank and just paste the value into the Text box. A successful challenge returns you to the prompt without an error.